I don’t know if it was the upcoming full moon, or Cinco de Mayo, or Derby Day, but there were two accidents on my way home on Friday (thank goodness I had 2 hrs to commute to my haircut) and then on my way home from the haircut, the power was out for quite a section of town and then there was a big accident at an intersection that did have power. I decided that we weren’t going anywhere on Saturday night if we could help it. 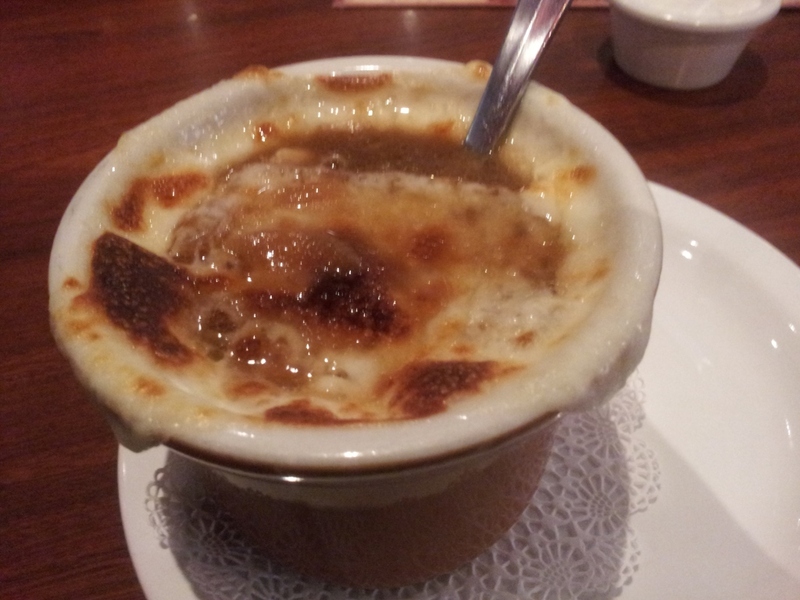 and the quatre fromaggio quiche with the French onion soup.It is hard to mess up French onion (although it is possible – imagine barely cooked onions in chicken broth with processed cheese melted on top – THAT restaurant has gone out of business) so that was pretty good. The quiche was, I don’t know – gummy? Parts of the crust were OK and parts were just meh, and the filling had maybe too much cheese, because it seemed to have collected at the bottom and was causing the gumminess. 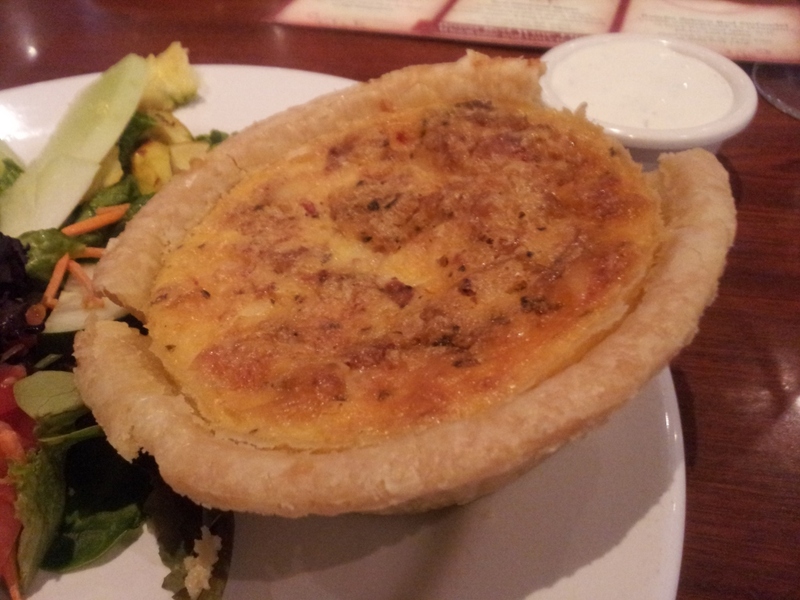 So, thumbs up on the wine and soup, thumbs down on the quiche. Report on my quilt last week from class: Good job on the design, but not so much on showing luminosity. I didn’t show enough of the direction the light was coming from, and the background wasn’t helping because it was too mottled and had some light in it itself. I still like it. This entry was posted in Restaurant reviews, Scary Food and tagged Denver restaurant reviews, Food by glenderella. Bookmark the permalink. 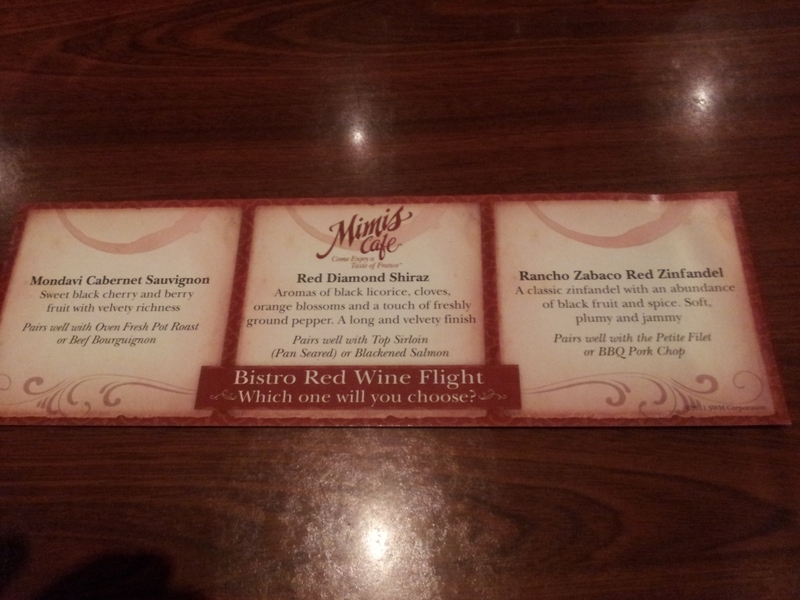 I can take or leave Mimi’s cafe. I’m not sure why – the menu always looks good, but the food never seems to live up to its potential. I really loved your koi quilt, it is a beautiful piece.